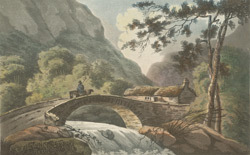 View of a stone bridge over a waterfall. The title of this work is ‘Port Neath, Vaughn’, however we cannot identify the area and the artist is unknown. The painting was published by Jukes in London in 1795.